Giotto di Bondone's masterwork, the Scrovegni Chapel in Padua, Italy, was overwhelmingly well-received and lauded by clergy, artists and lay people. Featuring dozens of painstakingly created, brilliantly colorful frescoes, the Scrovegni Chapel was di Bondone's first major contribution to the art world and helped win him the undisputed title of 'Father of the Renaissance'. 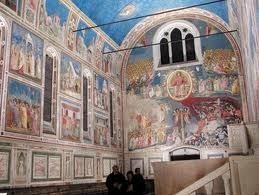 The Scrovegni Chapel - also known as the Arena Chapel - was completed in around 1305 to rave reviews. It had the added bonus of the Pope's endorsement and promise of indulgences to any pilgrim who made the journey to visit the newly-erected monument to the Holy Virgin. Many thousands of visitors flocked to the site, not only to receive those indulgences but to behold di Bondone's meticulous and awe-inspiring handiwork. 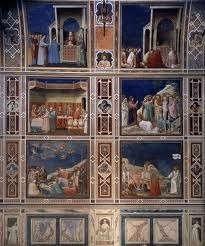 It is said that even the Pope himself, Benedict XI, visited Scrovegni Chapel in March of 1304. Records indicate that the Scrovegni family was equally pleased with di Bondone's product. Enrico Scrovegni, the wealthy financier who initially commissioned the chapel, was delighted with the fresco included at the back of the chapel (part of the Last Judgment fresco), which features a likeness of Scrovegni presenting a model of the chapel to the Holy Virgin and two attending angels. 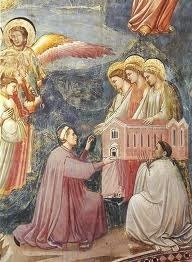 The chapel's only known detractor was a group of Augustinian friars living in the nearby Eremite monastery. These men, who feared that the new chapel would be competing with their convent church among the peasants for financial support, were loud in their protests that the chapel was too large and ornate for a simple family house of worship and its bells rang much too loudly. They also claimed during construction that the builders were not adhering to the original building plan and demanded that work be stopped. However, their protests fell on deaf ears and construction continued. In the years after the chapel's completion, its popularity continued to grow. Scrovegni Chapel continued to enjoy widespread critical acclaim after di Bondone's death in 1337, though whether the papal authorities continued to provide incentives for visiting is unknown. Despite its small size, it was used regularly for mass, particularly to pray for the soul of Scrovegni's father, Reginaldo. The poet Dante, indicating his disapproval of the deceased's usurious practices during life, set him down in the seventh circle of hell in his well-known Divine Comedy. Scrovegni Chapel was generally well maintained by Enrico Scrovegni and his family and regarded as a source of pride by the city of Padua. Throughout the fourteenth century there is evidence that other, minor artists added to di Bondone's original work, but not significantly so. Ownership of the Scrovegni Chapel probably changed hands more than once, the generations following di Bondone anxious to lay claim to his masterpiece. Enrico Scrovegni had purchased the land from Manfredo Dalesmanini at the beginning of the fourteenth century in order to build the Scrovegni family palace. Details regarding the chapel's ownership are murky until the nineteenth century, when it was purchased by the Foscari Gradenigo family. The chapel, regrettably, was allowed to fall into disrepair on their watch and remained in poor condition until the city of Padua purchased it in 1880. By that time, the portico had totally collapsed and other areas were threatening to. A full restoration was initiated by city authorities shortly after acquiring the chapel and continued intermittently into the twentieth century. It was further cleaned and opened to the public in the 1970s. Today, it is again prized as di Bondone's finest work and open to visitors year-round. Although Michelangelo's Sistine Chapel frescoes often overshadow the beauty and importance of the Scrovegni Chapel, the Paduan landmark remains revered among knowledgeable art circles and casual visitors alike. Its breathtaking color, painstaking detail, and the sheer scale of the narrative told by the frescoes win the hearts and admiration of all who behold them. The chapel, which can accommodate about twenty-five guests at a time, also features a special air-conditioned 'cooling off' room, where visitors are required to spend at least fifteen minutes before viewing the chapel's interior. The frescoes, while fully restored and in comparatively good shape, must still be protected from the deteriorating effects of human presence. The expenses associated with preservation is further evidence that the Scrovegni Chapel is truly regarded as the crown jewel of Padua. 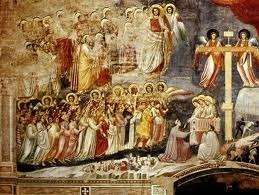 Over the centuries, Giotto di Bondone's decoration of the Scrovegni Chapel has come to be regarded as one of the capital events in the history of European art. The Chapel itself has become iconic, representing a decisive step out of the Middle Ages and into the enlightened period of the Renaissance. It symbolizes not only the beauty and grandeur of that time, but also the artists who helped transform the world with their paintbrush and genius.